Wahhhhooooo!!! I did it. And thank God the weather was kind. I felt good and ready for the half marathon on Sunday morning; I tried to go to bed a bit earlier than usual and had managed to sleep well, I woke up early to have some breakfast, and then tried to snooze a little more before I headed off to the West Midlands Showground – the start and finish point. To fuel my body as best as I could, breakfast was porridge and blueberries with a cup of tea. I also focused on drinking plenty of water to ensure my body was well hydrated before the race. The only moment of panic came when I almost left the house without my race number pinned to my t-shirt – thankfully, I remembered before I drove off! I’m not sure what problems it would have created had I not noticed until it was too late. Once at the Showground, there was a group warm-up which involved some squats and stretches, and then it was all about getting near the pacer that you wanted to follow. The pacers are there to help you get through the course in your target time. I ran this half marathon last year with a target of finishing in under 2 hours. It was the hottest day of the year and conditions were tough – I finished in just over 2 hours, which was an achievement (especially with the beating sun on my back!). This year I didn’t have a target time – I just really wanted to finish the course well. In the end, even without a target time, I finished with a better time than last year. Given I had broken my ankle in October, I was ecstatic with such a good time! I’m not sure if this was due to the kinder weather conditions or because of the time and effort I have put in this year to get me to my peak performance … who am I kidding? I’m going to take all the credit!! Standing on the starting line on Sunday morning was incredible! How often do you get to be with that many people, who all share the same goal as you? In this case, to finish the half marathon. The atmosphere was amazing and it made me proud, not only of what I was about to do, but also of how far I have come since my injury last year. It was great to see so many people out and supporting all of the runners throughout the course. Especially at the top of the Cop! The route went passed Nancy’s home a couple of times and she was watching from the window – it was a great boost to see a friendly face right before the slow and steady incline up Ellesmere Road. We were able to have a brief chat and she managed to take a few pictures. The last few miles were tough – my body was tired and parts of me were starting to ache but I kept going and focused on my goal of finishing strong. Running back into the Showground was amazing – there were loads of people lining the route cheering us on, which is always a lovely way to finish! At the end I got my medal, t-shirt and goodie bag, and found somewhere to sit down. Then I smelt the chips……. And I couldn’t resist! My official time was 1 hour, 55 mins and 32 seconds. I am very proud to finish, but also to have run in such a good time. I really enjoyed the route, even though it was tough. Running through The Quarry, around different parts of town and even some of the hills were fun (kind of…). I love that the route covered most of the town: seeing the different landmarks was a great reminder that this was the SHREWSBURY half marathon. There were some lonely parts to the course as well though – long stretches after the run up Ellesmere Road where there was only the occasional marshal to watch the runners pass – those bits were tough. It has been a long journey back from my broken ankle in mid-October, but it was completely worth it. I’ve had about 36 hours of personal training sessions, run over 120 miles in training, completed who-knows-how-many hours of yoga and had at least one adjustment a week (even more on the run-up to race day)! I really have to thank Glenn for his help and support, my personal trainer Ben for being patient with me during training, and all of you for your support throughout. My plan now is to keep on running, with the Lake Vyrnwy Half Marathon in September, and then the Greater Manchester Marathon next April. 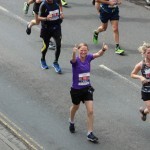 I’ll have to learn to run in a different way if I’m going to be able to finish the Marathon!